The European Investment Bank (EIB) has proposed to extend its shadow carbon price on which it bases its investments by 20 years to 2050, but doesn’t want to increase the proportion of its lending towards tackling climate change. The draft proposals are set out in the EU member state-owned bank’s climate strategy, which review its approach to supporting climate action. They are due to be adopted before October by the EIB’s board, whose 29 members are nominated by each member state and the European Commission. The EIB says it is the largest climate financier in the world, investing more than €88 billion over the past five years both inside and outside the EU. But it has faced criticism from environmental campaigners for continuing to lend extensively to fossil fuel-based projects and for favouring road and airport-building projects over rail and urban public transport. The bank has used a shadow carbon price to calculate environmental externalities since the late 1990s. 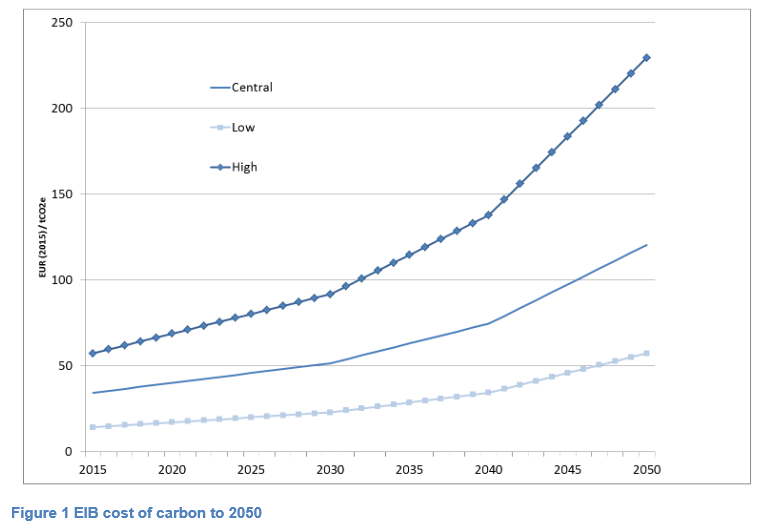 It proposes to keep its current calculations it developed in 2013, but extend the projections by 20 years to 2050. “Given the long asset life of some of the capital-intensive assets financed by the Bank … it is now necessary to extend the cost of carbon over a longer time period,” the proposal said. Its central estimate of around €30 this year rises by around €1 per year to 2040 and €2/year thereafter to give an inflation adjusted carbon price of €50 in 2030, rising to around €120/tonne of CO2 by 2050. This is well above the current €8.30 price per tonne in the EU ETS and the €25 per tonne level the European Commission expects ETS prices to average over 2021-2030. The EU member state-owned bank will keep the 25% lending ratio it sets for spending specifically on climate finance. But the bank said it will adjust its strategy within this overall level to gradually target lending towards projects that have a higher climate action impact and work to better integrate climate considerations across all of its lending. It said this will revise the way it calculates the climate impacts of projects and give higher priority towards those found to have bigger impacts for fighting climate change. It said it would not rule out counting new nuclear power projects as climate finance, despite Germany wanting it to be blacklisted. The bank also proposed to continue to support carbon offsetting “when no other alternatives are possible”. The NGO Bankwatch had urged the bank to rule out forest carbon offsetting. The EIB said it would review the level of its Emissions Performance Standard (EPS) again before 2020. Its previous review last October concluded to keep the EPS at 550g/KWh level first set in 2013. The EPS ensures the bank does not lend to projects that would emit more than that level. Environmental campaigners have praised the bank’s use of the EPS, though some had wanted it to be deepened to a level that automatically rules out lending to all unabated coal-fired power plants. Most won’t make the 550g grade unless they use the most advanced technology and co-fire biomass. The EPS resulted in the EIB pulling out of funding a 660 MW lignite power plant in Greece. The German state development bank is still helping to fund the project, E&E reported last week. The bank also said it would not follow the lead of Norway’s sovereign wealth fund of deliberately shifting its portfolio away from fossil fuel investments. “The Bank is a long term lender and by principle, does not divest from its investments,” it said.